Hello, I'm stumped, been ignoring this for a while but I'm concerned of missing things when making searches etc. I have a FF profile where the following page opens with a bunch of charts, you have to scroll down to see all the charts and text. In several other profiles, even one I just started fresh and made no changes to, it shows just the top of the page then a phone number that is normally at the bottom [moved to the top of the page]. I also tried this in safe mode, no change. As near as I can tell there is nothing special about the one profile that works. I could site other behaviors, but first could someone try this link and see if it displays normally for you? I took some screen shots but it appears they need to be loaded to an external hosting site? Tel (44) 01472353993 Mobile 07974435627.. If it's near the top with no text or charts to scroll through, you have the same problem as me. thanks for your time and any info! Last edited by ttggzz on September 4th, 2018, 12:09 pm, edited 1 time in total. So, the "other behaviors" I was talking about, I recently did a search for something, then was looking for the text on the page. Apparently the text I was looking for was under a picture, as I was typing in the "find in page" search area the text was appearing beneath the picture [like a caption]. Without typing in "find in page" the text was invisible. Something is wrong! it shows just the top of the page then a phone number that is normally at the bottom [moved to the top of the page]. If I look at your page source, I see nothing that would indicate "charts". IOW, from what I can tell, what you are expecting to be there is not - because it isn't there. So if at some point it was there, the page changed & it is not there - currently. content="Convert Whitworth,BSF,BA,AF sizes to metric.Wrench,socket,nut and bolt sizes explained." 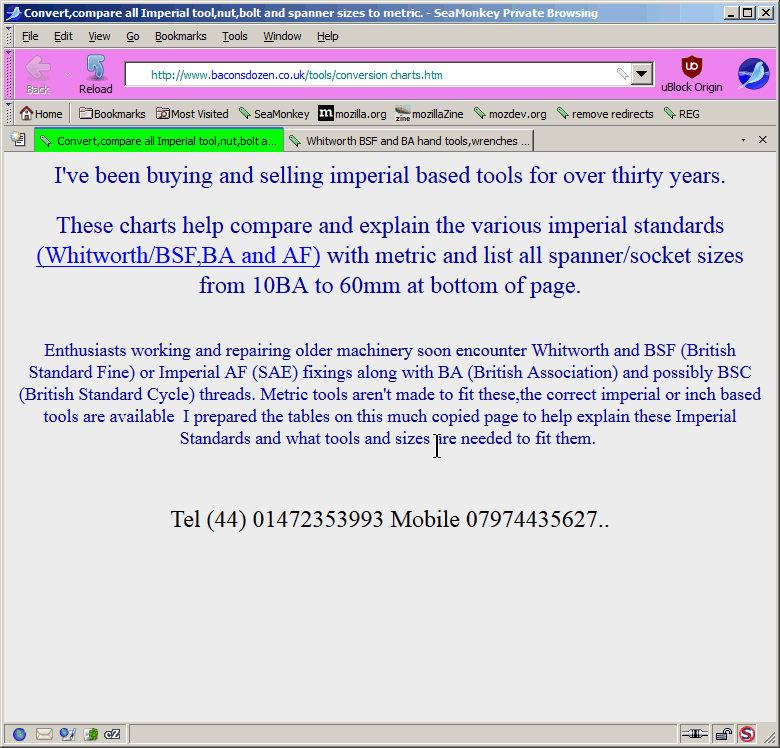 content="AF to metric,imperial size conversion,british standard whitworth in mm , wrench sizes inch to mm, spanner sizes, imperial spanner sizes, BA sizes to mm, english spanner sizes to metric , af to mm, convert imperial to metric tool sizes,whitworth in metric"
thanks, yeah I guess I had that page loaded for a loooong time. I reloaded it and discovered my mistake [see my second post]. A bit embarassed! Is that a screenshot you posted? How did you do it? I didn't see any options when I was posting. Posting a screenshot on the forum.